There is a lot to unpack, and I will not get to it all. Before we get to the civic issues, I want to take a closer look at the religious angle. The bible is clearer on this subject than most. The passage with which I opened this post makes it clear that those who believe in the name of Jesus will pick up snakes with their hands and be safe from poison. Before continuing, let us consider a scale of religious lunacy: 5 being as nutty as it gets, 0 being not at all crazy. I would put snake handling at a 4.2. It is not the stupidest thing I have ever heard of. We might give the act of speaking in tongues a 3, and healing the sick by laying on hands, a 2.5. Driving out demons gets the same score from me. Yet, all of these things are promised in the same verse, and given equal billing. If you believe in any one of those things, you should also accept snake handling. The liberal Christian who prays to their god for various and sundry magical interventions has no right to roll their eyes at the snake handler. Believing that one will survive the bite of a poisonous snake requires less magic, and has more validity than believing that your telepathic pleadings are being transmitted and received by a person who lives beyond space, and that the person can and will, as a result of those transmissions, intervene in the course of nature to make your life a little better. Now that’s crazy. Mainstream Christians who try to distance themselves from the insanity of snake handling are so far down the rabbit hole, they are no longer capable of recognizing irony. Things are just as interesting from the civic point of view. The religious practice of snake handling has been outlawed in much of the US. Southern states seem to have laws on the books specifically dealing with religious snake handling. As you might imagine, the practice is most prevalent in the South. Lawmakers have had to deal with the issue in that region where people are more likely to stick their hand in a basket of rattle snakes in the name of the Lord. Some of these laws make a point to call out religious snake handling as opposed to just handling snakes for other purposes. At least one seems to outlaw the handling of even non-poisonous snakes in a religious setting. While this direct attack on religion makes me chuckle, it also leaves me baffled. In some places, it is illegal to keep certain types of animals as pets. Poisonous snakes are among those forbidden animals, along with lions, tigers, and bears. In those states, forbidding snake handling makes more sense. But on a practical level, snake handling is extremely common and not illegal. People do it all the time. I have been associated with a number of church camps. Though I do not have the skill, I’ve known lots of people who routinely handle poisonous snakes, mostly to remove them from the camp site where kids are likely to be. In fact, I’ve known kids who could do it. In some parts of the country, it is a rather practical skill to have. I wish I had it. If a camp counselor grabs a snake and says a prayer while handling it, is he snake handling? Where I grew up, he would not be doing anything illegal, immoral, or weird. It only gets weird when it is done in a church building while dancing to Christian music and speaking in tongues. The wannabe attorney in me is inclined to defend the snake handlers. Just the other day, I went on a tirade about the Arizona law that allows business owners to practice open discrimination just as long as it is religiously motivated. This is a stupid and dangerous exercise of religious freedom that will adversely effect the life, liberty, and pursuit of happiness of millions of people. Snake handling as a religious practice effects a few cultists that represent an evolutionary dead end. Yet the law comes down on them as if they mattered to society. They don’t. 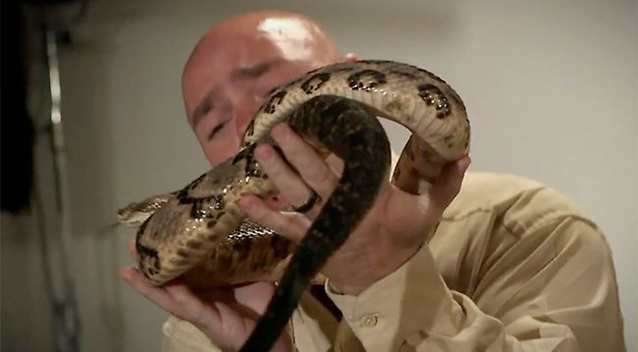 The more practitioners of snake handling who die from snake bite, the less attractive the religion becomes… and that’s a good thing. In the end, that might be the reason why snake handling has been outlawed in the Southern states. Those kooks give conservative religion a black eye. Religionists have no reasonable way to distance themselves from the more obvious nut jobs. They all will be lumped together. However, outlaw and marginalize the snake handlers, and the fundamentalist message is less diluted. I don’t know how much sense that theory makes. But it makes more sense than the laws currently on the books. Religion is making fools of us all.